Late spring is the time for strawberries, and this ice cream recipe featuring their tart sweetness comes to you just in time for some warmer weather. 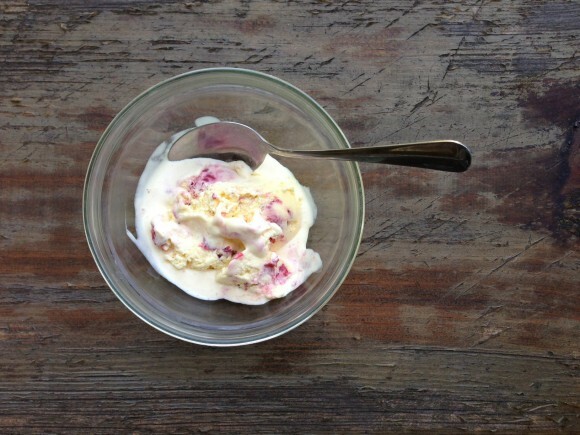 My tastes lean more toward the savory end of the spectrum, which was what prompted me to add goat cheese to ice cream in the first place, but is also why there’s not much sweetener in this recipe. However, the richness of the custard and the brightness of the berries makes this a satisfying treat, best enjoyed in little bowls with good company and a balmy evening breeze. Whisk together the eggs yolks and sugar or honey in a medium sized bowl and set aside. In a large saucepan heat the milk, cream and salt if using to just below a simmer (small bubbles should be forming around the edge of the pan), stirring occasionally to prevent a “skin” from forming on the surface. Reduce the heat to low. Temper the egg yolk mixture by slowly (about one tablespoon at a time) adding up to one cup of hot dairy and whisking in each addition thoroughly. Add the egg and dairy mixture back to the pan with the vanilla extract and cook, stirring constantly, until the custard has thickened enough that it forms a thin coat on the back of a spoon, and a finger swipes a clean line across. In a medium sized bowl, mash the soft goat cheese with a fork. Add in a little of the warm custard and stir to blend the goat cheese into a loose paste. Add the remaining custard, whisking thoroughly. Cool in the refrigerator, than pour into an ice cream maker and freeze, following the manufacturer’s instructions. In a freezer proof container, layer the berries and the ice cream, beginning and ending with a layer of berries. I like to make lots of thin layers so that the strawberries are distributed well throughout the ice cream. Freeze for at least an hour before serving. Preheat the oven to 350. Hull and halve small berries; quarter larger berries. Place the strawberries on a baking tray (lining it with parchment will save you time and trouble), drizzle with olive oil and salt and toss with your hands to coat. Roast for 20-30 minutes, or until the strawberry juices look very thick but have not burned to the tray. Immediately transfer the berries and their juices to a bowl and stir in the vinegar. Allow to stand for at least 30 minutes before layering into the ice cream.